Your Mimeo Digital admin library is set up so you can easily sort content into categories that make sense for your business model. You can sort content into file types, into placeholders, into classes, or whatever hierarchy makes sense for you. Mimeo vocab: The categories you see in your administrator library are not reflected in your end-user's library. Your end-user's content will be organized based on distribution name. Here's how to set up categories and sort your content. To add a category, click the "plus" button next to "Library." This will open a text box at the bottom of the category list. Type in the name of your category and click away to save. You can also add sub-categories. Read more in this article. 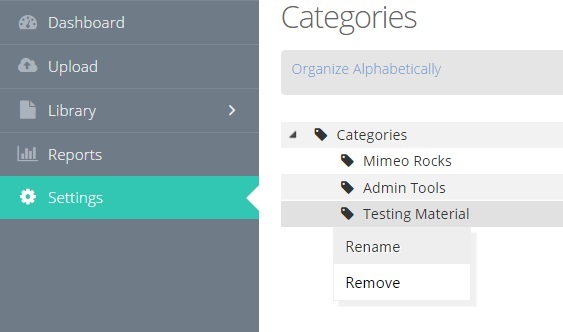 To organize based on your own hierarchy, drag and drop categories into the proper order. To rename or remove a category, left-click on the category name. This will open a drop-down menu from which you can choose either to rename or remove the category. If you remove a category that has content in it, that content will be reorganized back into the general library. If the content is already sorted into multiple categories, it will stay in its current category folders, minus the deleted category. 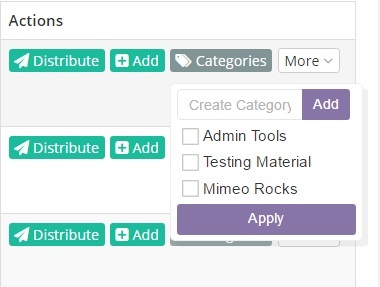 Once you set up your categories, you can sort your content into categories from your admin library. After uploading, locate your file in the library. The drop-down will offer you the option of either an open text box for creating a new category or a checklist of previous categories that you can choose from. Select as many categories as you see fit. You can select more than one category for each piece of content. If you have not created any previous categories, you will only see the text box and "add" button. After you have clicked the "apply" button, the piece of content will disappear from from your general "Library" folder and only appear within the categories you selected. To access category folders, hover your cursor over the "Library" tab in the left-hand navigation pane. This will expose a drop-down of your categories list. Select the category of choice to open that folder.